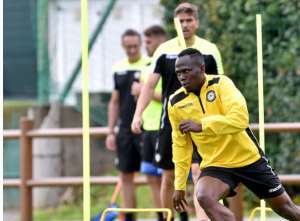 Ghana midfielder Emmanuel Agyeman-Badu has undergone a successful surgery at Udinese ahead of the start of the new season. The midfielder will be unavailable for preseason activities but will be ready for the start of the new campaign as he bids time to recover. According to Udinese, an arthroscopic surgery was undertaken on his left knee, and was performed by Professor Mariani in the Villa Stuart structure in Rome, was perfectly successful. The player will remain hospitalized for 24/36 hours and will reach immediately after Udine, to begin the therapeutic path with the company’s healthcare staff. Badu returned from a season-long loan from Turkish side Bursaspor and he is expected to be one of the key players for manager Julio VelÃ¡zquez. The 27-year-old joined Udinese in 2010 and spent most of his career in Italy until he joined Bursaspor last season. His experience will be pivotal for the Zebras next season.